Pioneering GIS Professional Development Workshop at University of Nyala, Sudan! 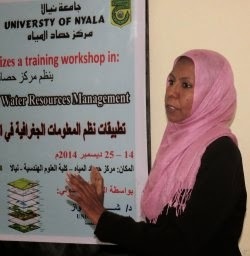 The Interfaculty Department of Geoinformatics-Z_GIS was invited to conduct a workshop on 'Integrated Spatial Planning and Water Resources Management' at the University of Nyala (UofN), Sudan from 14th to 27th December, 2014. This was the first ever GIS professional development organised at this university. The workshop was hosted by the Water Harvesting Centre (WHC) at the Faculty of Engineering Sciences. Dr. Shahnawaz (Z_GIS) and Dr. Wifag Hassan Mahmoud (Director WHC) delivered the 2 week long workshop to 20 participants from the Ministry of Urban Planning and Utilities - Survey Department, Ministry of Water Resources and Electricity, Ministry of Agriculture, World Vision - Sudan and from the Faculties of Education and Engineering Sciences, UofN. Workshop participants studied the concepts of GIS, GeoDBMS creation and management, processing - classification - analyses of vector and raster datasets as well as work with digital elevation models (DEM). The workshop concluded with a high level of satisfaction expressed by all participants. It was followed by a meeting with top University Administration, with the Acting Vice Chancellor, the Deans of the Faculties of Engineering Sciences and Education as well as the Director of WHC expressed their gratitude to Z_GIS and to Dr Shahnawaz for their contributions and communicated their desire to transform this cooperation into a long term institutional relationship! Michael Hagenlocher, associated student of the Doctoral College “GIScience”, defended after 3 intensive years of PhD research his topic “Integrated spatial indicators for modeling, exploring and visualizing vulnerability to vector-borne diseases” successfully. Prof. Michael Leitner from Lousiana State University and Prof. Alexander Fekete from Cologne University of Applied Sciences acted as discussants whereas his first supervisor Prof. Thomas Blaschke served as the chair of the committee. Michael is a multi- and interdisciplinary researcher, working at Z_GIS, with a broad interest in socio-economic, health and development-related issues. Before taking on his current position at Z_GIS in 2011 he completed his Master in geography, sociology and geoinformatics at the Universities of Tübingen and Stuttgart. In 2013 Michael held an appointment as visiting graduate student at the Harvard School of Public Health (HSPH), Boston, USA. We wish Michael all the best for his future career! 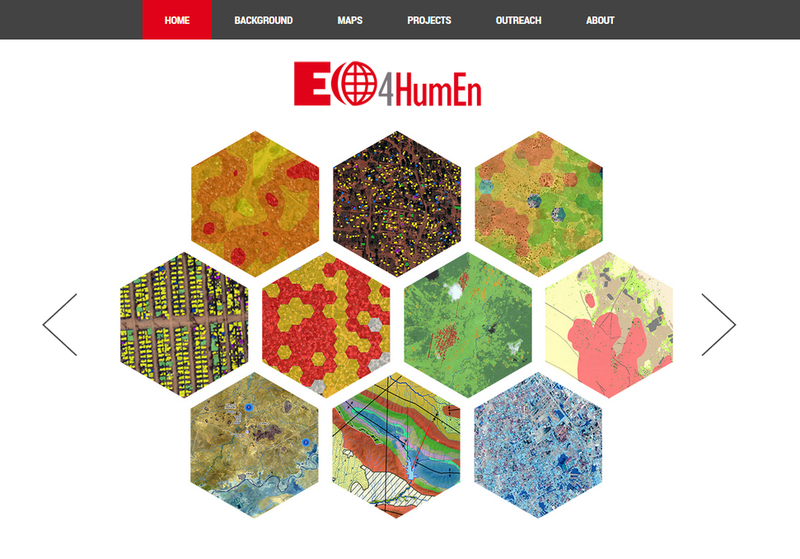 In the frame of the first annual meeting of the EO4HumEn project, Z_GIS presented its new released website on Earth observation-based humanitarian services. The website covers Z_GIS’ efforts to provide state of the art routines and services for crisis-related geo-spatial information on refugee and IDP camps as required by aid organizations in mission planning and day-to-day operations. The activities are carried out within the project EO-based information services in support of humanitarian operations, funded by the Karl Kahane Foundation. The services are further improved within the EO4HumEn project, an ASAP-9 30-months project funded by the Austrian Research Promotion Agency (FFG). The first EO4HumEn annual project meeting took place in Salzburg on November 26, 2014. The meeting presented the achievements of the first project year, reflecting on the status of the deliverables and discussing the forthcoming work. The project team appreciated the positive feedback from FFG regarding the progress of the project. A major upcoming dissemination activity of the EO4HumEn project is the organization of a special workshop on “Earth observation for Humanitarian Operations” (EO4Hum) at the GI_Forum 2015 in Salzburg. The special session EO4Hum will focus on the potential of EO data and technologies to support humanitarian action in crisis and disaster response. We welcome contributions from related research and practical application fields, including new methods, tools and technologies for providing geospatial information products related to all phases of humanitarian crises. 'multiGIS' Workshop successful in Malaysia! The Department of Geoinformatics - Z_GIS completed a week-long international capacity building workshop on 'Multi-Disciplinary Applications of GIScience in Southeast Asia (multiGIS)' at the National University of Malaysia (UKM). The workshop was organised jointly by Z_GIS and the School of Social, Development and Environmental Studies (FSSK), UKM from 17th to 21st November, 2014 followed by a field excursion on 22nd November. It was co-funded by ASEA Uninet, Austria. Under the direction of Prof. Josef Strobl (Head, Z_GIS), Dr. Shahnawaz (Z_GIS) and Dr. Lam Kuok Choy (PPSPP) conducted the workshop at UKM. Dr. Abdul Hair Awang (Head, PPSPP) inaugurated the workshop and Prof. Mastura Mahmud (Deputy Dean of Research, UKM) awarded the certificates of successful completion to the workshop participants. Focusing on interdisciplinary faculty development, 29 teachers and postgraduate students from 16 universities in 5 countries (i.e. Indonesia, Malaysia, Philippines, Thailand and Vietnam) participated in the workshop. The participants worked on individual projects covering a range of multi-discplinary applications of GIScience in Southeast Asia using ArcGIS Desktop software and presented the outcomes in the concluding session. The consortium of the EC-FP7 funded project TIRAMISU works on implementing a toolbox to assist the Mine Action community in addressing the removal of Anti-Personal Mines, Submunitions and UXO (unexploded ordance). Z_GIS is concerned with the development of object-based methods to map indicators of mine presence (IMP; e.g. 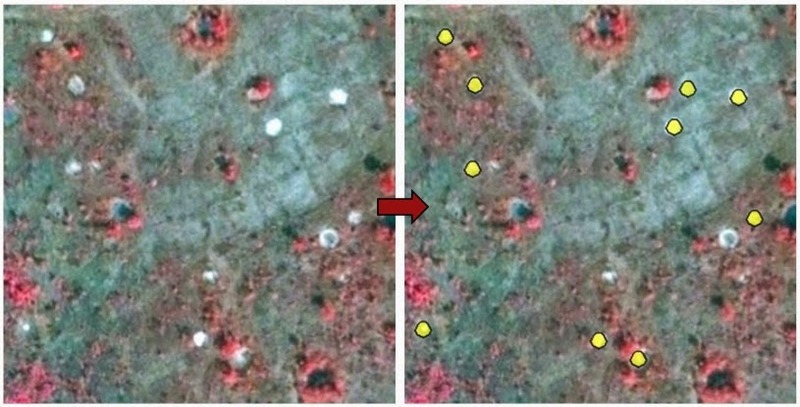 trenches, walls, craters) and specific land use/land cover classes based on remote sensing data in mine-affected areas in Croatia and Cambodia. A conceptual risk and vulnerability framework, which serves as a guidance tool for the conceptualization, systematization and operationalization of social vulnerability to landmines/UXOs is also being designed by the Z_GIS team. Spatial vulnerability analyses are performed as a contribution to the prioritization of possible intervention areas. For more information, please contact Daniel Hölbling. A modelling framework aimed at obtaining reliable income projections at the regional level in European countries will be presented. The methodological setting allows for an explicit assessment of model uncertainty in terms of the choice of explanatory variables and the specification of spatial spillovers. The group exploits and expands recent developments in Bayesian model averaging in order to construct projected trajectories of income per capita at the regional level and exemplify the workings of the methodology by examining the potential contribution of future educational attainment changes to economic growth and income convergence in the European Union. At the "Well-being in the Information Society Conference" held from November 13-14, 2014 in Pécs (Hungary) Hermann Klug presented an integrated holistic landscape lab with an example on "Modelling and measuring phosphorus emissions into surface water bodies". This presentation was accompanied with a live demonstration of measurements from a low cost weather station streaming values live to the internet. The service offers up-to-date and custom-tailored information products on population estimates, dwelling density and internal structure of refugee and IDP (internally displace people) camps and temporary settlements. 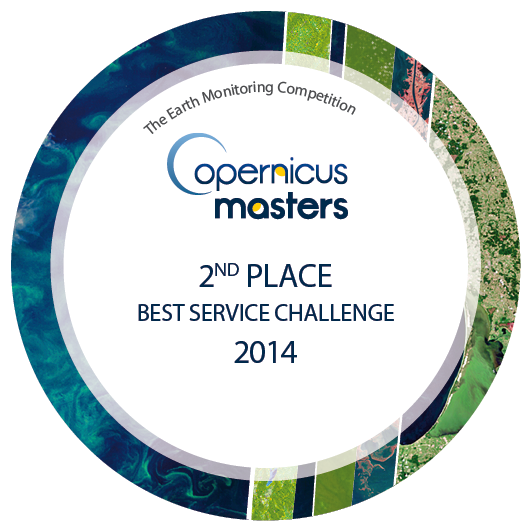 Monitoring is achieved by automated analysis of Earth Observation (EO) data using object-based dwelling extraction, density calculation, camp growth analysis and environmental impact analysis. This provides essential information for relief interventions during humanitarian crisis. Z_GIS is providing the service to Médecins Sans Frontières (MSF) on demand since 2011. For more information, please contact Stefan Lang and Petra Füreder. 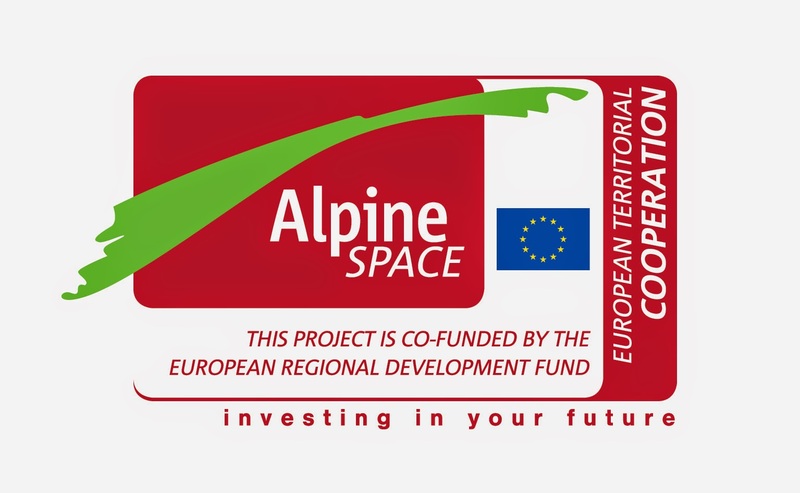 The C3-Alps initiative was co-funded by the Alpine Space programme, through the European Regional Development Fund and conducted by a transnational consortium of 17 partners from all Alpine countries. The capitalisation approach of C3-Alps aimed at generating adaptation knowledge that is useful to decision-makers, its effective transfer to target groups, and its actual implementation in real world adaptation processes. Results shall contribute to enhancing development and implementation of adaptation policies, to implementing bottom-up action on adaptation on regional and local levels, and to communicating adaptation concerns and "how-to-do" adaptation knowledge to decision makers. Z_GIS together with EURAC and the Environment Agency Austria (Umweltbundesamt GmbH) designed and implemented the Climate Adaptation Platform for the Alps. The platform provides knowledge (in several languages) about adaptation to climate change in the Alps from local to transnational scale for political decision makers, public administration, municipalities, entrepreneurs and researchers alike. The final C3- Alps international conference in Vienna focused on the current practice and future of climate change adaptation in mountain areas. Regions and municipalities from Alpine countries and beyond presented their achievements, shared their experiences and discussed about the way forward in coping with climate change. For more information please contact: Hermann Klug. Virgo (VIrtual Registry of underGrOund Infrastructures) is a European EC-CIP project with the aim to implement a cloud virtual registry of utilities infrastructures. In the last 9 months, Z_GIS was involved in the first three work packages of the project. One of the recent main tasks was a state-of-the art institutional scenario analysis; - The utility network situation of all EU countries was analysed and responsible public administrators/operators managing infrastructures in the EU countries were identified. Z_GIS was responsible for the analysis of three countries: Austria, Germany and Slovenia. 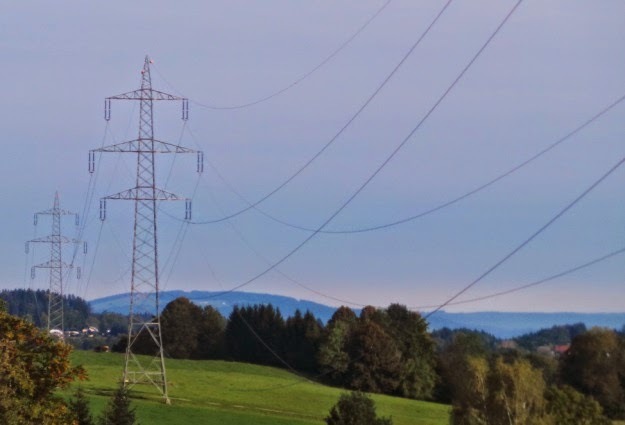 The results of the institutional scenario analysis show possible futures of the compulsory provision of utility network data in the EU countries. At the moment the Z_GIS project team specifies and finalizes the user/service requirements and system architecture of the VIRGIO system in order to start the feasibility study in a next step. For more information, please visit the project website or contact Elisabeth Weinke. Z_GIS is very active in developing conceptual frameworks to represent risk and vulnerability analysis in the context of disaster risk reduction, climate change adaptation and vector-borne diseases. In this context, the department has developed approaches to model and represent vulnerability through innovative spatial analysis methods, going beyond traditional composite indices. This includes the integration of various spatial datasets as well as expert knowledge and participatory approaches at the community level. Assessments have been carried out in Europe (Austria), southern and eastern Africa and South Asia. 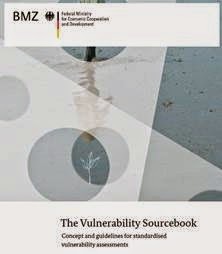 GIZ – The Vulnerability Sourcebook: Concept and guidelines for standardized vulnerability assessments The sourcebook aims to present a standardized method for vulnerability assessments. This was implemented together with EURAC and adelphi and through the contribution of Stefan Kienberger through a contract by the “Deutsche Gesellschaft für Internationale Zusammenarbeit (GIZ)”. Birkmann J, Kienberger S, Alexander DE (eds.) 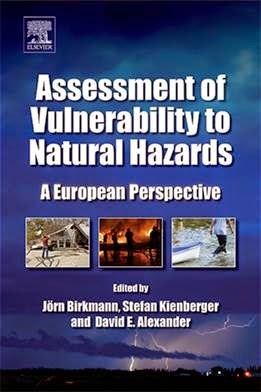 – Assessment of Vulnerability to Natural Hazards – A European Perspective. Elsevier This edited book comprises results from the MOVE project, including the Z_GIS assessment results (and methods) for the Salzach catchment. Assessment of Vulnerability to Natural Hazards covers the vulnerability of human and environmental systems to climate change and eight natural hazards: earthquakes, floods, landslides, avalanches, forest fires, drought, coastal erosion, and heat waves. A new paper on the “Spatial-explicitmodeling of social vulnerability to malaria in East Africa” is now online accessible via the website of the International Journal of Health Geographics. The paper is one of the key results of the HEALTHY FUTURES project. It presents the ‘state-of-the-art’ in modelling ‘integrated geons’ including now methods on indicator pre-processing and local sensitivity analysis.